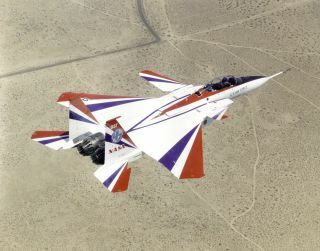 In a test flight over the Mojave desert, the F-15B Active tests a new thrust-vectoring conception. An F-15 ACTIVE soars over the Mojave desert during a High Stability Engine Control (HISTEC) flight operated by NASA on Aug. 1, 1997. The twin-engine F-15 is equipped with Pratt & Whitney nozzles, new at the time, that could turn up to 20 degrees in any direction, giving the aircraft thrust control in the pitch (up and down) and yaw (left and right) directions. NASA was flight testing the new thrust-vectoring concept on the F-15 research aircraft to improve performance and aircraft control. The new concept was designed lead to signifigant increases in performance of both civil and military aircraft flying at subsonic and supersonic speeds. NASA pilot Rogers Smith and photographer Carla Thomas flew an F-18 chase to accompany the flight.